Among an assortment of new cars, crossovers and concepts that will fill up the Volkswagen stand at this week’s New York International Auto Show, plenty of attention will likely be focused on one dubbed the Tarok. In recent years, the German automaker has made a big push into the light truck market, models like the big Atlas crossover helping it reverse years of declining sales. But the Tarok concept vehicle could see Volkswagen make its return into a segment it abandoned decades ago: the compact pickup truck. “Although there are no plans to produce the vehicle for the U.S. market, the Tarok concept is being shown to gauge market reaction for a truly versatile and compact entry-level pickup,” the automaker said in a statement released ahead of the prototype’s unveiling on Wednesday during a NY International Auto Show media preview. 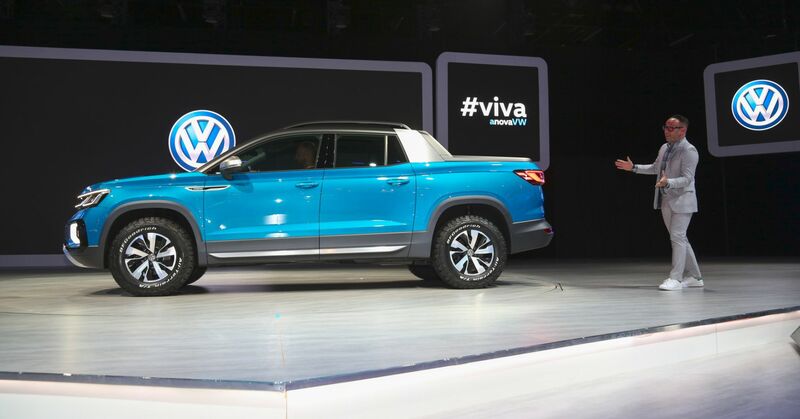 VW currently offers pickups in a number of global markets, but it hasn’t played in the segment in the U.S. since dropping a truck based on its old Rabbit hatchback in 1984. But company officials have clearly been reading the tea leaves, especially as the American market for midsize trucks has staged a rapid turnaround since mid-decade. Coming out of the Great Recession, all three of the Detroit-based automakers abandoned midsize trucks, as did Honda, many industry executives, including former Ford CEO Mark Fields, predicting the segment would all but dry up. But since General Motors made its return in 2014 with the Chevrolet Colorado and GMC Canyon models, sales have rebounded. In 2016, Americans purchased 448,398 midsize pickup trucks, a figure that jumped to 524,231 last year, according to industry data. “And there is plenty of room to grow,” said Joe Hinrichs, president of automotive operations for Ford, which brought its own midsize model, the Ranger, back into production late in 2018. Volkswagen first teased the possibility of reentering the U.S. pickup market at the 2018 New York auto show unveiling the Tanoak concept based on its three-row Atlas sport utility vehicle. The Tarok concept that will be introduced at New York’s Jacob Javits Convention Center this week was previously revealed at the Sao Paulo International Motor Show in Brazil late in 2018 but is being shown in the U.S. for the first time. It measures 193.5 inches, bumper-to-bumper, or about 21 inches shorter than the Tanoak Concept. The Toyota Tacoma, the segment leader with 245,659 sales in the U.S. last year, measures anywhere from 212.3 to 225.3 inches, depending upon the body and bed configuration. Despite its diminutive size, the Tarok is designed to handle a payload of up to 73.2 inches, however, slightly longer than what many of the current crop of midsize trucks can fit in their bed. To pull that off, VW explained, the rear seats, along with the panel that normally separates the passenger compartment from the cargo bed, fold away, extending the cargo space. The Tarok would be one of only two pickups based on a passenger car platform, rather than a classic, truck-like body-on-frame chassis. The other is the slow-selling Honda Ridgeline. VW has taken pains to show that Tarok would be able to handle serious workloads, among other things fitting it with an underbody skidplate and an all-wheel-drive system that, with the turn of a rotary dial would be tuned to off-road conditions. 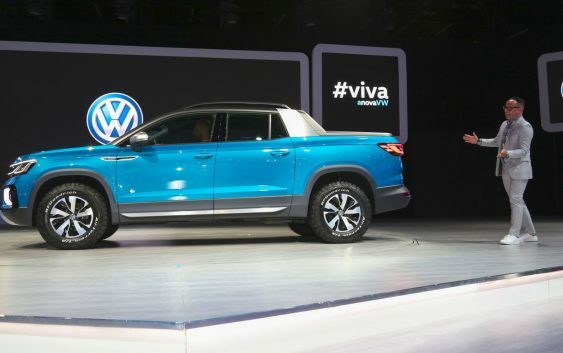 Keogh told the website VW has “opportunities to do it ourselves,” should it choose to get back into the pickup market. But the German automaker in January inked a joint venture with Ford that will see them collaborate on the development of future commercial vehicles. Hinrichs has confirmed that the two companies are exploring other possible partnerships, including electric vehicles. And pickups are also reportedly under discussion. For its part, Ford has confirmed it is also looking at opportunities for a pickup smaller than its new Ranger. Officials have declined to confirm whether they might work with VW on such a project. The sales surge in the midsize truck segment has other manufacturers looking at their options, according to industry analysts. Hyundai, for one, has confirmed it is moving ahead on the development of the Santa Cruz, a model that would be based on a well-received concept vehicle of a few years back. Like the Tanoak Concept, the Cruz prototype also used creative engineering to carry a large load, in this case, a pull-out bed extender. Hyundai officials have said they hope to have the Santa Cruz in production by late 2020 or early 2021.